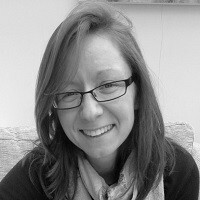 Leela Barham takes a look behind the schemes for patient access in England and puts the case for a review to bring them up to date, in the light of changes since they began in 2009. Patient Access Schemes (PAS) have been a formal part of the pricing and reimbursement environment in the UK since they were added into the Pharmaceutical Price Regulation Scheme (PPRS) in 2009. They’re defined in the 2014 PPRS as: ‘facilitat[ing] patient access to a medicine where the National Institute for Health and Care Excellence’s (NICE) assessment of value, on the current evidence base, is unlikely to support the list price’. (They’re called lots of other names too, such as risk-sharing schemes). o Number of doses required. • Risk-sharing: where outcomes measured, and price adjustments and/or cash transfers were made in both directions (company and NHS) in light of outcomes. Over time, though, PAS have been divided into those that are ‘simple discount schemes’ and those that are ‘complex schemes’ as recognised by the dropping of the taxonomy in the 2014 PPRS. 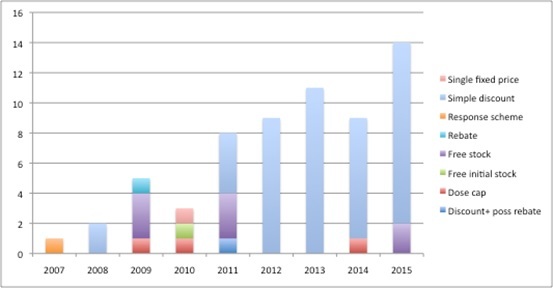 And indeed it does follow practice in the market; analysis of schemes approved by NICE shows the dominance of simple schemes in recent years (Figure 1). But what the headline stats from NICE don’t show is the behind-the-scenes work that goes on. Exactly who wants to have simple schemes? Is it companies or is it the ‘system’ (or, in fairness, both)? And at what point do schemes fail when they’re going through the approval process? A Freedom of Information Request allows us to look at what companies put forward. 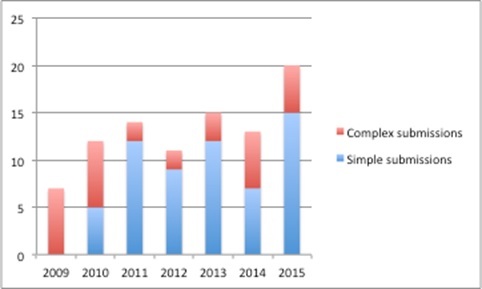 This suggests that submissions were focused on complex schemes in 2009 but, by 2011, companies were more likely to put forward simple schemes (Figure 2). It was in 2011 that Department of Health (DH) and ABPI guidance suggested companies keep schemes as simple as possible, and offered a four-week Patient Access Scheme Liaison Unit (PASLU) review for simple schemes, versus 12 weeks for complex schemes. In addition, companies could approach DH informally to get advice before they formally submitted. The DH said data on that isn’t collected. Although it is just speculation, it seems a reasonable assumption that companies were urged to go for the simple option in such meetings. In recent years though, companies seem to be opting for more complex schemes again. Making a submission to the DH is just the first step for companies. The DH acts as a ‘gateway’ before companies can even table a scheme formally as part of a NICE appraisal. The PPRS sets this expectation by further defining PAS as ‘a scheme proposed by a scheme member and agreed between the Department (with input from NICE) and the scheme members in order to improve the cost-effectiveness of a medicine and enable patients to receive access to cost-effective innovative medicines’. 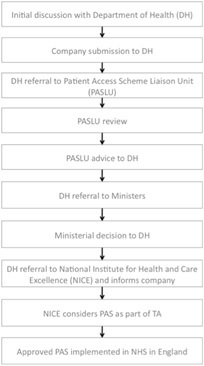 The figure below summarises the 10 steps for getting a PAS through the system and into the NHS. It’s not easy to discover what happens from the point that a company makes a submission and when that final NICE ‘yes’ comes through. Some insights can be gleaned from comparing data from the DH and what is available from NICE (figure 4). The DH notes that it had to put together data manually so these should be considered indicative and not definitive, plus, given the complexities of the process, where companies can withdraw and re-submit, no strong conclusions should be drawn. However, it suggests that most submissions pass through DH scrutiny, Ministerial scrutiny, and it can be at review by PASLU and NICE where there are stumbling blocks. 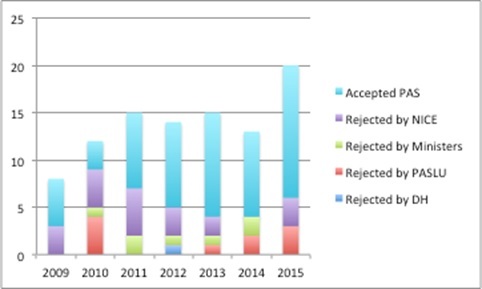 Although there’s no evidence, it’s a hunch that Ministerial rejections come from PASLU concerns. 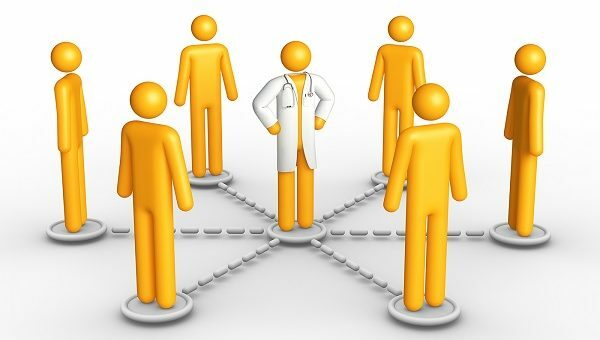 And don’t forget that at the point that a NICE Appraisal Committee is looking at the PAS it’s about whether it does enough to address whatever concerns that they have; that might be to do with clinical effectiveness, as well as cost effectiveness, and a PAS might just not do enough to change their minds. The 2014 PPRS allows for a review of PAS. Last time one was conducted it produced some useful guidance for companies. With the number of submissions and schemes rising it would be useful to bring the process up to date. For example, the PASLU process guidance is (still) interim five years on (it dates back to September 2009). That means it pre-dates the creation of NHS England and Clinical Commissioning Groups (CCGs), which are, collectively, the buyers of medicines in the NHS in England today. Bigger issues may be worth exploring too, such as streamlining the process. Is it really proportionate to require DH and Ministerial sign off? Plus, is it worth re-thinking an almost default position of ‘simple is best’ at a time when there is much potential for IT to help gather and analyse data? Especially given the high coverage of cancer by PAS, which accounts for almost half (30 of the 62 approved PAS), and where the Systemic Anti-Cancer Therapy dataset is mandated. This includes collection of a range of data, with some believing it could support new approaches, not least indication-based pricing. With the 2014 PPRS including a provision that a review, ‘if needed’, has to be initiated no later than within two years of the new scheme, one needs to be started now to ensure that the opportunity is not missed.